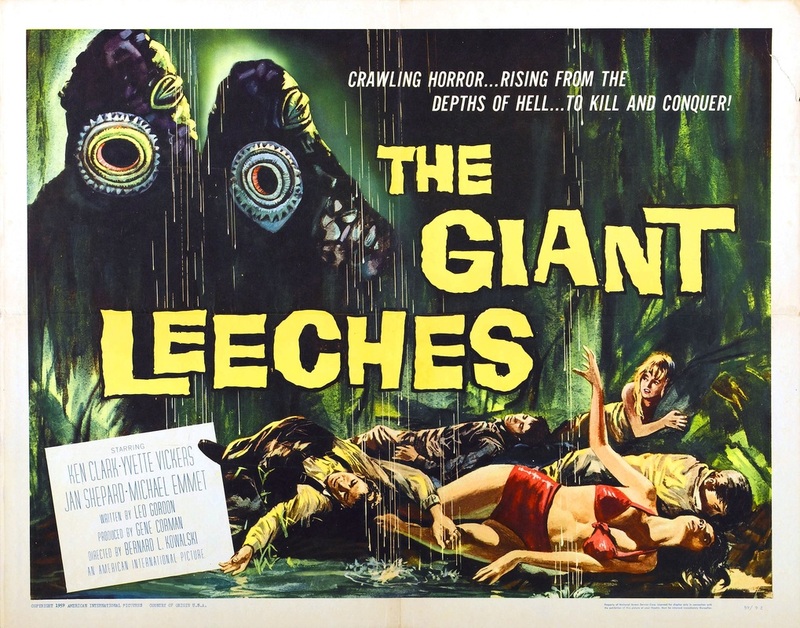 For a B Movie, this one had so many different titles: the Giant leeches, Attack of the Giant Leeches, Attack of the Blood Leeches, and She Demons of the Swamp. 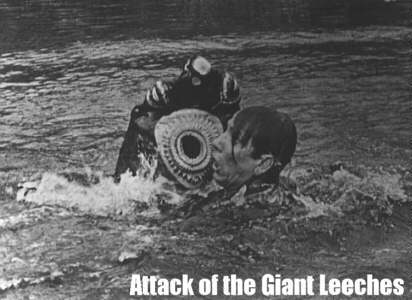 One does not hear a title like Attack of the Giant Leeches wondering what kind of film he is about to see. It’s all right there in the title. 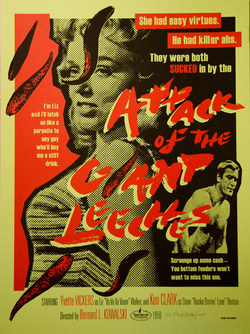 Mutant, giant leeches attacking people… like most monster movies from the fifties, there’s the easy connect to fear of atomic radiation (which created the Giant Leeches as well as the Giant Ants in Them!). 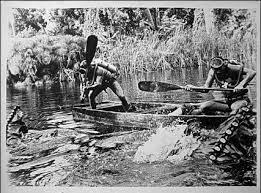 In that sense Attack of the Giant Leeches serves us as an Allegory. 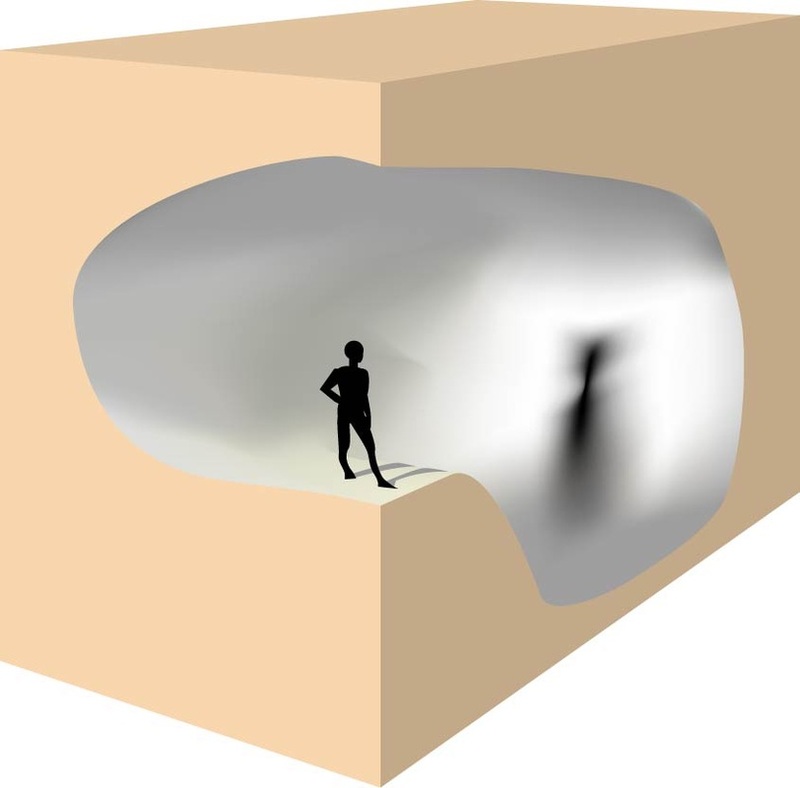 In an Allegory, the characters represent something else, usually higher ideas or concepts or abstractions. They could also represent an historical event, such as the testing of atomic bombs. 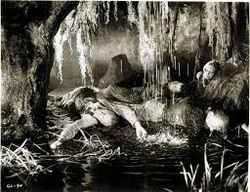 In this film we’ve got several allegorical representations. There’s Steven who is the town policeman…of course he represents the legal system and the way things have to proceed to maintain civility in a civilized society. There’s even a scene where he articulate the bureaucracy of the situation and why he cannot do certain acts. The Leeches themselves are symbolic of the dangers of atomic energy. When one character posits the question as to their origin, another character says, “Maybe the proximity to Cape Canaveral’s got something to do with it. They use atomic energy in the first stages of launching.” He goes on to suggest it could have caused a Gigantism of mutation. Not an original plot idea for sure, but here used affectively. There are other minor characters that are allegories for behavior. One character, Liz, is the loose woman who cheats on her husband and does other questionable things like listening to jazz music! 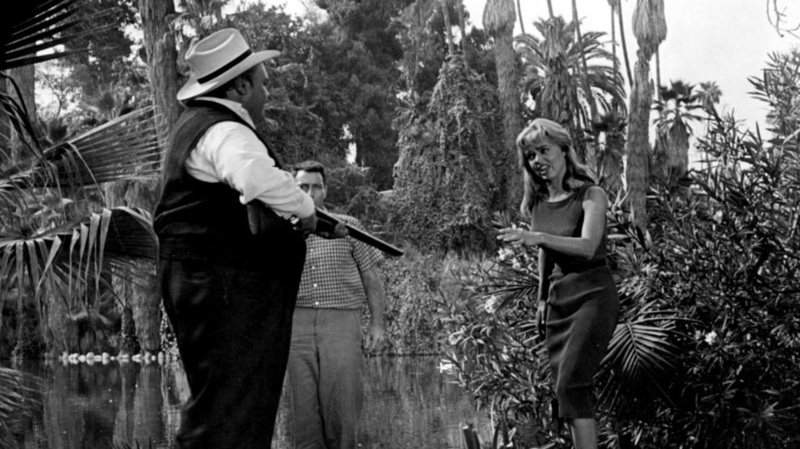 There’s a scene where she and he paramour are laying round discussing her husband disdainfully. He catches them and of course they end up in the water getting attacked by the leeches. Then there’s the town folk who all seem to know exactly how to handle the situation, but are forbidden to act by the law. They represent Common Sense. There’s more, but I think you get the picture. This movie is both slammed and venerated in film reviews. It still amazes me how someone can watch a film from half a century ago and judge it’s qualities by modern standards. It’s just ridiculous. It’s like saying Michelangelo’s Sistine Chapel paintings aren’t good because they’re not digital. Kind of stupid, but there’s plenty to enjoy in this Very very B Movie, complete with its recycled soundtrack, so let yourself have some fun. When a character represents something other than himself, like an ide or an event or a concept.